Yesterday I said I’d write a little blog about Ice Fever, which has gripped the country since the cold snap started in the first part of the week. By the middle of the week canals were starting to freeze, and everyone started talking about whether the Elfstedentocht might be possible this year. This is a 200km race between 11 towns in the province of Friesland (to the West of where I live), but it can only happen if the ice is 15cm thick for the whole route. On Wednesday, they didn’t think it would happen, but now it’s predicted that the ice will be thick enough by this time next week! In the meantime, people are already heading out on frozen lakes, canals and ponds. Two people have died but that doesn’t seem to be holding anyone back. 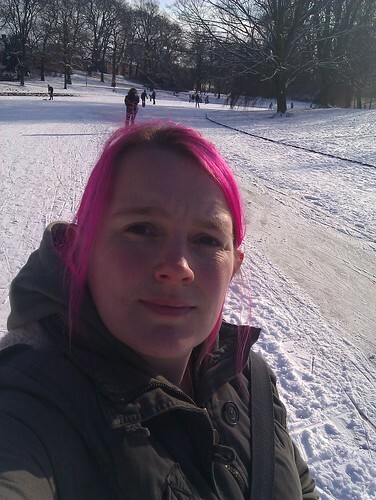 When I went out for a walk today, I saw people skating on the ponds in the parks, but no-one out on the canals. We had 5cm of snow on Friday and it’s hiding weak spots in the ice making it more dangerous. Everyone is getting their skates sharpened, and heading off for favourite spots. I haven’t skated since I was a teenager, but I really want to give it a go! People were having so much fun at the park today. I really enjoyed my expedition today, it was good to get out and stomp about. I went to the city centre and the park to look around and enjoy myself, not just a utilitarian trip to buy food or visit someone, and it was good. I should do it more often. I even saw some intrepid folk running where the pavements / roads were clear and not slippery. I might have run out of excuses … I only have 3 weeks before Matt comes out (yay!) but I had a goal in mind for weight and fitness and it’s slipping away from me, assisted by warming winter foods and an addiction to cappuccino. I’ve borrowed the title of this post from my Dad, @zackzee … he used it earlier this evening and I liked it so I have nabbed it. The failing I am talking about is my 365 project. When I first arrived in the Netherlands I started a 365 picture project to catalogue my first year here. I did really well for about 200 days and then it got really difficult. Today it snowed (this is relevant, bear with me), and I took some pictures and realised a) why I hadn’t been ‘365-ing’ and b) that I miss it and that finding a picture is something to look forward to and a little bit of creativity in my day. You see, with all the snow, I want to take some pictures tomorrow as it’s all very pretty and I am wishing Matt was here to see them with me, so the next best thing is to take pictures to send him instead. I use my HTC Android phone to take my photos, and it has been getting very very buggy about letting me see the ones I have taken. I can find them on the SD card if I plug my phone in, but they don’t appear in the gallery, or any application that uses the gallery, like flickr or twitter. It’s been getting increasingly frustrating to take pictures! I also have no idea what picture we’re up to now, and sitting down with a diary would be tiresome and depressing. It was also in part leaving for and coming back from work in the dark, that caused the hiatus. Pictures of my office or the container or me get boring after a while and I don’t have the right gear to take decent night-shots. I am also jealous of instagram. I know it makes all pictures look a bit the same and a bit hipstery, but it also makes them look nice, and cute. I don’t think I’m a very good photographer, and this was putting me off a bit. So, tonight I’ve uploaded all of my ‘lost 365’ pictures- the ones that should have been 365’s but aren’t, and I’ve given them their own home on flickr. I’ll restart my 365 on my 365th day, and see where it takes me. For now, enjoy these from a recent trip to Amsterdam.